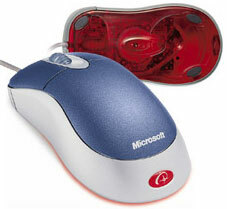 When Microsoft released the first optical mouse without a special pad, the company became a trendsetter for a while in mouse-building. As it often happens, the innovation was replicated by all mouse makers - today almost every company has a wide range of optical mice, while machano-optical models are now developed only by A4 Tech - but this company deals with pure optical products as well. To stay "in the saddle" Microsoft had to develop new models to cover the whole market (because optical mice stopped by that time being something unique and expensive), and improve the old technology (thankfully, there were things needed to be improved). They implemented it in the new optical system now used in three new Microsoft's mice - Wireless IntelliMouse Explorer, IntelliMouse Explorer (new versions) and IntelliMouse Optical. The expensive mice based on the new optical system (it was Hi-End but more affordable now) were the direct competitors for the Logitech' MX series. However, they had something for other categories of users including the most specific things (I mean Wireless IntelliMouse Explorer for Bluetooth :)) who were satisfied with the characteristics of current optical mice but desired something unusual, high-quality and inexpensive. 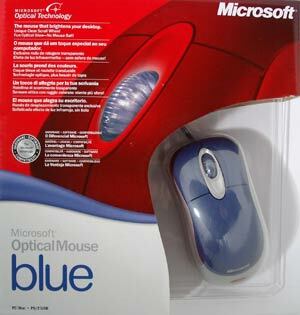 Here is one of such Microsoft's mice - MS Optical Mouse Blue. The mouse is packed in plastic and put into a usual cardboard box with a cut-out revealing the mouse. Thanks to its unusual appearance, it really attracts attention. 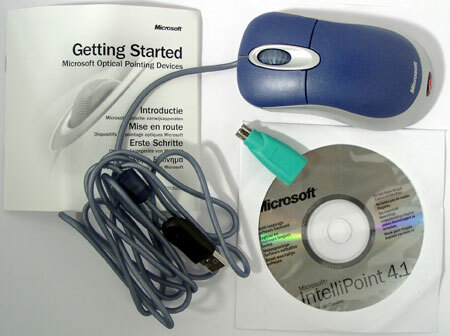 The mouse comes with standard accessories including a CD with software, a brief user manual and a USB-PS/2 adapter. 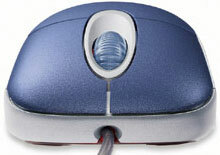 On one hand, it is an ordinary optical mouse whose forefather IntelliMouse Explorer appeared three years ago. The technology is the same - IntelliEye. Two keys plus a scrolling wheel also used as a button throw us back to 1995 - the time of the first IntelliMouse. But its design raised a lot of discussions right after it was released. The list of its features includes a lot of items concerning the exterior. But what about the squeak? The experts at Microsoft assume they have done their best to make the mouse as handy as possible. But every mouse maker says the same. Every time users should try a mouse themselves, because people tend to have different hands. Some like MS's mice, some do not. It can also be possible that those who spat at IntelliMouse Explorer (because of its large dimensions) would fancy the OM Blue and vice versa. In general, Microsoft always paid due attention to ergonomic of its mice, that is why there is nothing to worry about. They said it about the uncommon shape and colors. Well, you can make sure yourselves. We heard it already 7 years ago. However, I must say that the scrolling became a little better but it's rather the software improvement. Well, the wheel is really worth focusing on. It is wide enough, ribbed, semitransparent and perfectly working. It's, possibly, the best thing I've seen so far. I don't thing it's worth making buttons customizable if they are only three. Although the third one can be used at your discretion, some programs do use it actively. However, the new versions of the IntelliPoint have one feature which brings a lot of benefit even on mice with few additional keys or even without them; I will tell you later about it. The mouse is absolutely symmetrical, which Microsoft makes really seldom. This item means only that the adapter is supplied. There is nothing surprising - any USB mouse can now work via the PS/2 port as well. It can change soon because new mainboards rarely use PS/2 ports. This is also a standard for USB mice. So, only the design catches the eye. Note that some design tricks are taken from the old solutions, for example, a lamp illuminating the MS Optical Technology logo on the back. Some like it, others don't, but it looks traditional. The last review of a Microsoft's mouse was published two years ago already. Since that time the software was changed considerably - last time we spoke about v3.1, and the Blue comes with v4.1 (it is also available at the company's site). I wonder what changed together with the number. The CD contains almost the same data volume - 22 MB. The support of several languages takes a good part of it. The size of the English version makes 10 MB, but still, it seems to be quite a lot. Some time ago a full software suite needed only a diskette, and why it is so huge now is unclear - the capabilities are not ten times as great. In contrast to the old version, the first tab here is the most important one - Buttons which sets functions for the mouse's buttons. Unlike the MouseWare, IntelliPoint doesn't try to guess a type of a mouse connected and leaves it for the user (the number of customizable buttons depends on the type). One one hand, this is a weak point, but on the other hand, you can use mice different from Microsoft: you must only choose one with the appropriate number of buttons. At any time you can return to the defaults pressing just one key. At the same time, IntelliPoint does not prevent other programs from using additional buttons; this is a distinguishing feature of many competitive solutions. 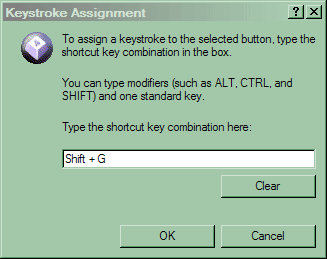 Besides, the list of possible variants is really long - you can set even short keyboard macros. Unfortunately, it's not macros in the full sense of the word: one key, possibly with a modifier; unfortunately, the additional keys of the multimedia keyboards are not supported. But hot keys are unsupported by 90% in almost all programs, that is why such feature still looks great. But the most flexibility and power are provided by the checkbox "Enable program-specific button settings". Let's tick it off and press Settings. So, in the v4.X we can make specific settings for programs we want irrespective of global settings. Just add a certain program to the list and make settings for it. On the photo you can see a special setting for the Photoshop: it doesn't really need AutoScroll but Undo is used quite often. Why not to assign it to the middle button? It will work as such only in Photoshop, while other programs will use their own preferences (assigned by programmers or us) or global settings. Thus, you can benefit a lot even from three standard keys. The next two tabs are standard for any mouse. The fourth one is for the wheel. What you can see on the page doesn't exceed standard functions, but we always have a way to go deeper. We enable accelerated scrolling and press the button. What is acceleration? Originally this concept referred to the mouse pointer: it could have a different speed relative to the mouse's one. For example, if you slowly move a mouse by 1 cm, the mouse pointer runs one cm, if you do it quickly, it runs 5 cm. The first scrolling mice had the constant scrolling speed. It said that one step scrolled three lines. 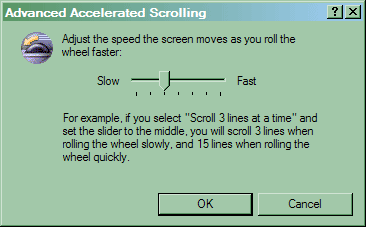 Ten steps moved the pointer by 30 lines, irrespective of how fast you turned the wheel. Now the faster you turn it, the speedier the pointer moves. 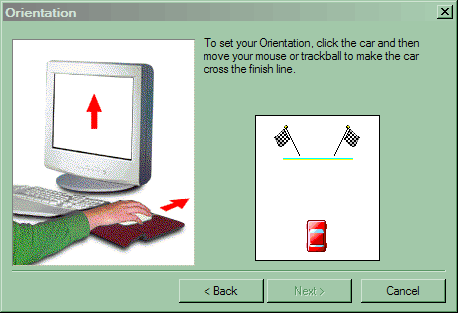 In the box you can set the acceleration degree. Is acceleration needed at all? On one hand, PgUp/PgDn are still there :) But why to jump constantly from a mouse to a keyboard and back? You can ignore this function if you don't need it. At least, it doesn't make worse. The button Advanced from the Wheel Troubleshooter tab can disable the wheel in certain programs or everywhere. It's quite important - in the end many modern programs support scrolling themselves and do that better in their cases than IntelliPoint (which simply translates respective mouse's messages into usual ones). But there are old programs where such preprocessing is needed. 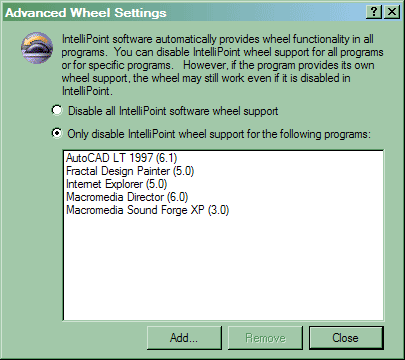 It wasn't supported from the very beginning in IntelliPoint (at first scrolling in Microsoft mice worked only in programs meant for scrolling). On the whole, in spite of some disadvantages, IntelliPoint can be considered the best program in its class taking into account that it's possible to assign functions particularly for each application and binding the buttons to keyboard macros. First of all we checked the maximum sampling frequency of the mouse. Microsoft's mice never set records in this sphere, but the OM Blue's scores disappointed me a lot - only 100 Hz. That is why you can connect the mouse to any port - it doesn't matter. Well, it looks strange enough because even the wireless Logitech MX700 gives more. That is why this mouse is not for 3D games. On the other hand, it wasn't destined for them - if you play games, then you should go with the new-generation optics. But for office this is one of the best solutions, and first of all, thanks to its scrolling wheel. Besides, it fits the hand well, at least, mine, but most probably, it will satisfy most users with "average" hands. The buttons are easy to press, and they make no noise. The mouse perfectly glides along the table or the plastic pad. It works nicely if you don't make it do what is is not designed for. It's not MX or Explorer 3.0 which can be pushed by even one meter per second - here the optics is old and at the speeds over 40 sm/s the mouse can just lose the grip of the pointer. 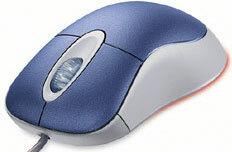 But for the design this is an ordinary optical mouse with typical parameters. I haven't found anything extraordinary in this mouse, but it doesn't mean it's bad - the requirements simply grow up with time. If the Blue appeared 2-3 years ago, it would be a fairy-like success. Now at the same sum of money you can get the Logitech MX300 with the new-generation optics and a higher sampling frequency (which is better for games). That is why you should choose carefully. Who are the buyers of the OM Blue? It doesn't suit for games. Or it is as good in them as the old Explorer and the like, but today the market offers more "playful" mice. For graphics packets? Then it should have more buttons and a higher resolution. Well, again, I can't say the mouse won't cope, however there are models which can better handle such tasks. So, the best sphere of application for the Blue is offices (not the poorest, of course) and users not very demanding for additional functions and 3D games who do not want to pay through the nose and who desire a high-quality gadget of an original design from a well-known manufacturer. Well, the mouse was developed for this market and they hit the mark.